The wooden Yo-Yo: a simple, nostalgic childhood toy, with the potential to be so much more. TMBR Toys strives to create, produce, and distribute high quality toys that exceed expectations people have about wood toys. 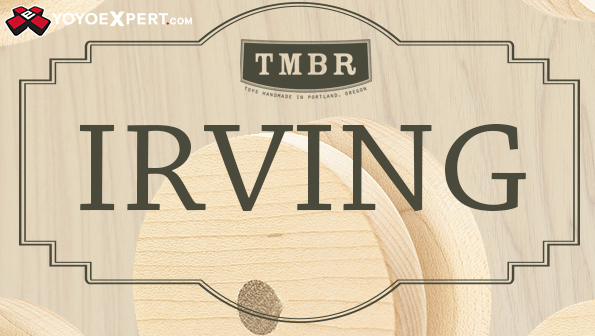 With a new twist on the classic toy, TMBR's Irving wooden yo-yo has a tapered gap, flat rims and a through hole on one side for knots. It is slightly oversized for a longer spin time: important when you are looking at a fixed axle throw. This is a great yo-yo for people who want a non-bearing yo-yo to practice their tricks and hone their skills to precision. Plus, there is an elegant beauty to this Yo-Yo's simplicity; maple body, walnut axle, and handmade in Portland, Oregon; it would be a perfect classic to add to a collection. Not to mention this is one of the first wooden yo-yos built with the advanced player in mind!